That’s right! The most Instagrammable game that has completely rocked Canada and the US has arrived in Europe! 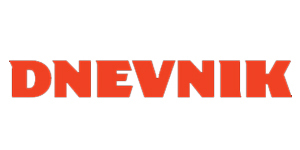 The best fun in town! 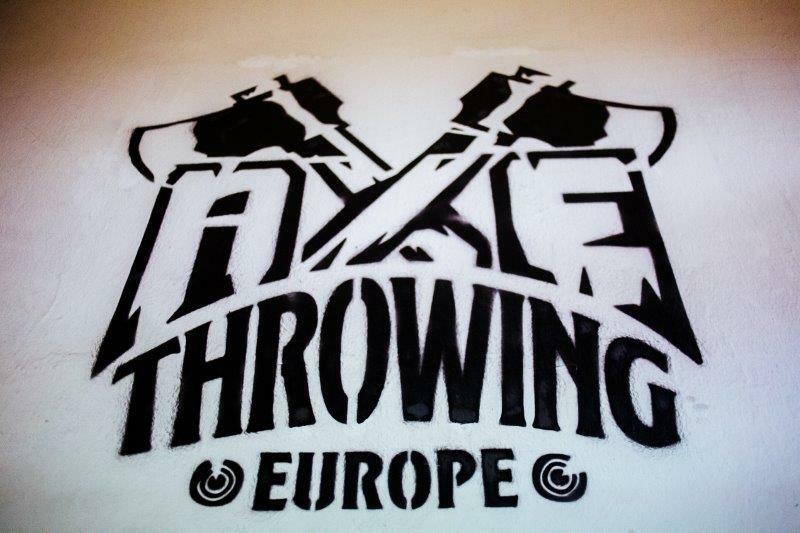 At “Axe Throwing Europe™”, the largest European center of axe throwing, located at Kajuhova 35 in Ljubljana, as many as 100 players can compete at the same time. 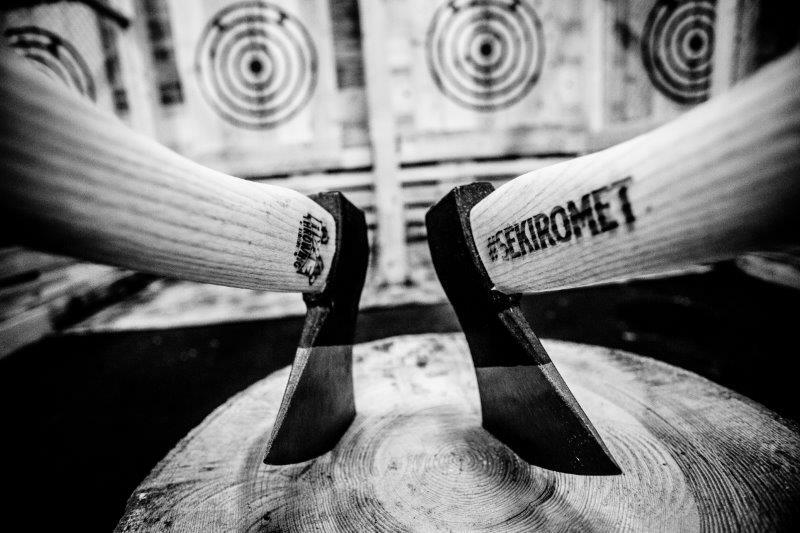 Under the guidance of an axe-pert instructor, six players can throw at one target. 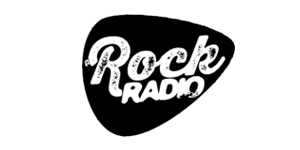 An exciting experience for everyone! Nothing compares to the feeling of when the axe sticks into the wood at the center of the target. Everyone can enjoy in the game, regardless of strength or gender, the technique is what’s important. Don’t worry: the game takes place under the guidance of an axe-pert instructor in a fenced-in space. After the instructor explains the rules and shows you the right technique, you can enjoy the fun competition games in a 90-minute guided program. Great idea for team building! A great opportunity for a gathering with friends, birthday celebrations, bachelor and bachelorette partys and teambuilding events! You can also surprise your loved ones with a gift voucher! The thrilling game that has completely addicted Canada and the US has arrived in Ljubljana! 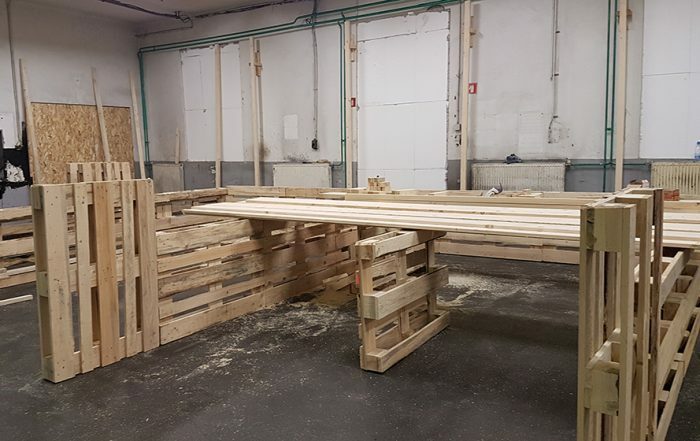 In probably the biggest European AXE THROWING Center at Kajuhova 35 (next to Bauhaus in BTC), up to 100 players can compete simultaneously at 12 targets. Of course, under the careful guidance of experienced instructors, who will take you on an hour-and-a-half-long program with fun guided games for an unforgettable (and safe) adventure. 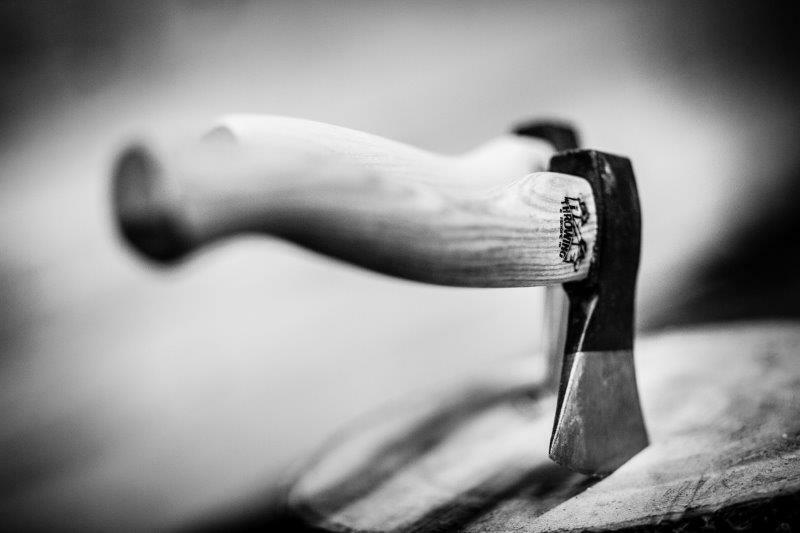 Combining its long handle with one of the first prehistoric tools, the axe is the grandmother of all tools (and weapons). Initially, it was a made from stone, later, from bronze or iron. 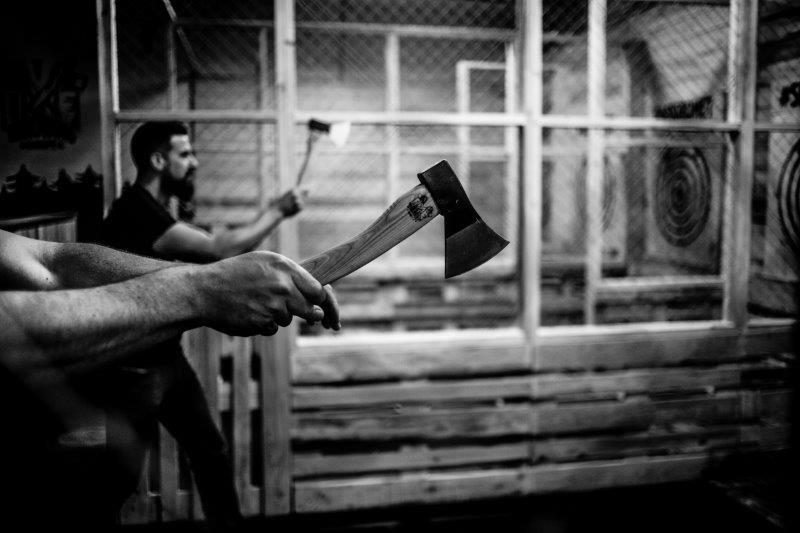 The Franks, our northern neighbors, began with axe throwing in the 5th century, who went into battle equipped with axes. 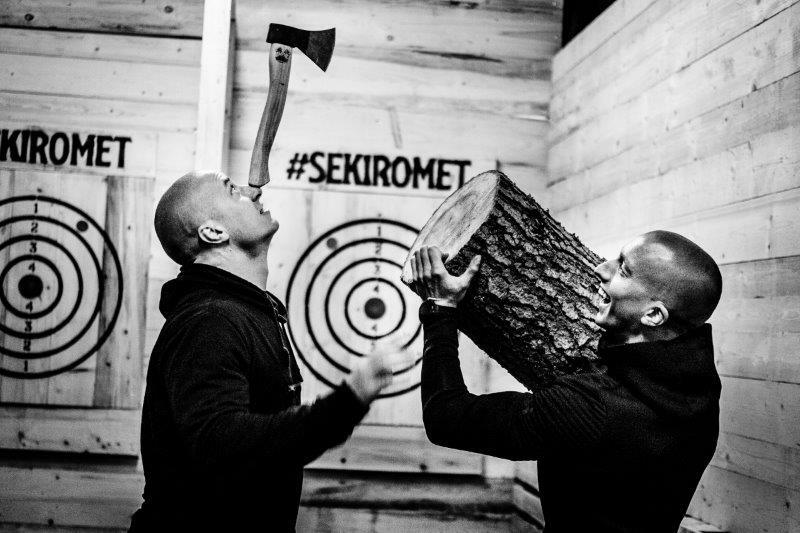 The ancient Celts were the first ones using axes for sports purposes, and the popularity of axe throwing is still preserved in Nordic places. 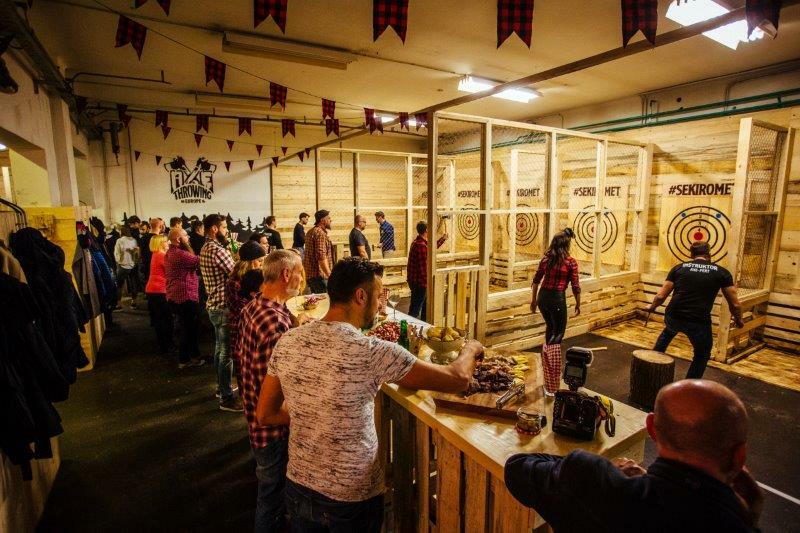 In recent years, the Canadians and Americans were the first ones who started throwing axes for fun! This has evolved into a modern sport practiced in more than 50 countries around the world. 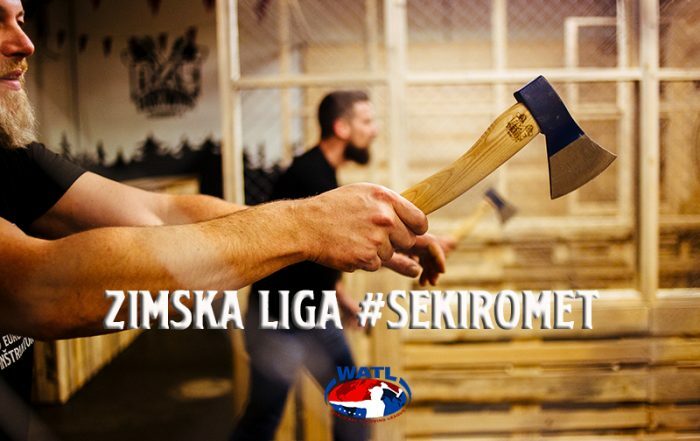 Our Axe Throwing Europe™, which opened its doors in Slovenia, the green country of forests, with a long forest tradition is also member of the most widespread competition sports league WATL or the World Axe Throwing League. It sounds dangerous. But is it really? 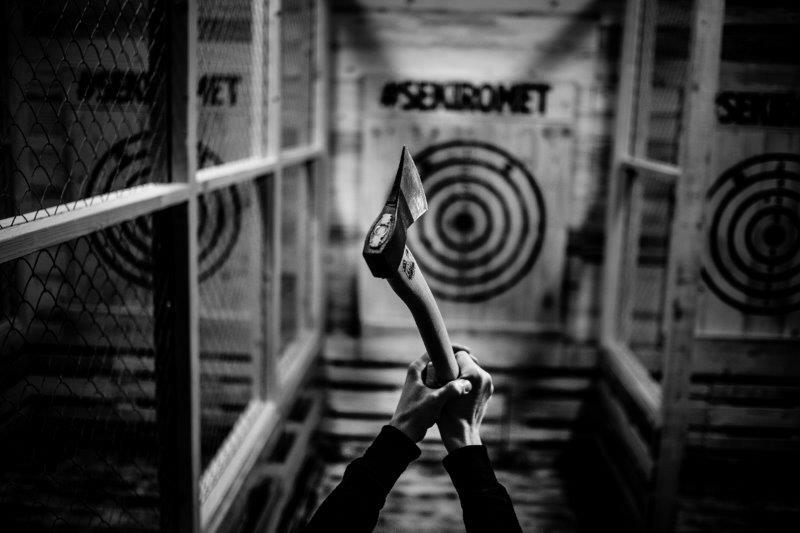 Taking into account the rules and instructions of the instructor, axe throwing is no more dangerous than darts or bowling. 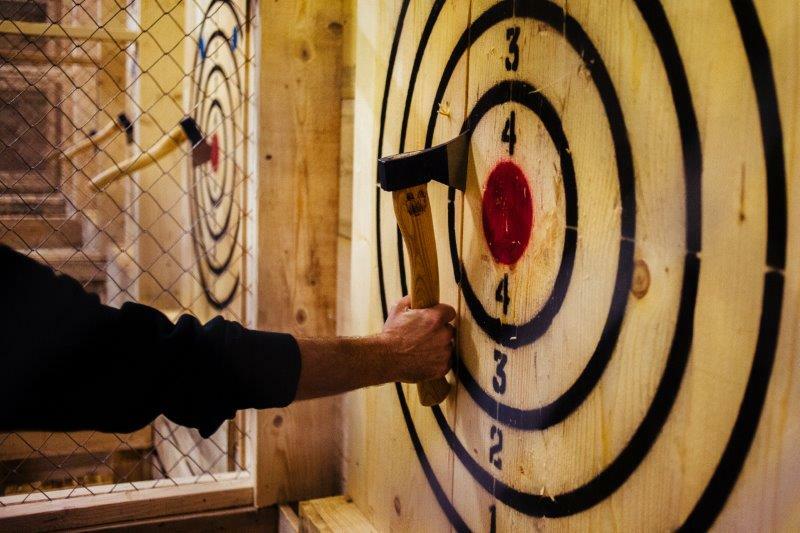 In Canada and the United States, where they have been throwing axes for a couple of years now, they know almost no injuries, as the rules of throwing prevent dangerous situations. Safety first: The enclosed spaces for throwing and appropriately trained instructors ensure that all players understand and respect the rules of the game. 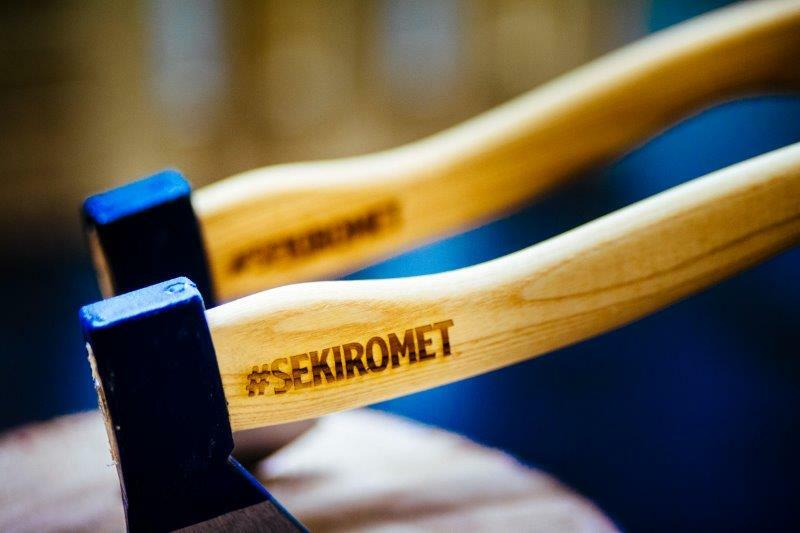 PS: We do not use axes with rubber handles and rubber floor tiles, so axe can’t bounce back. 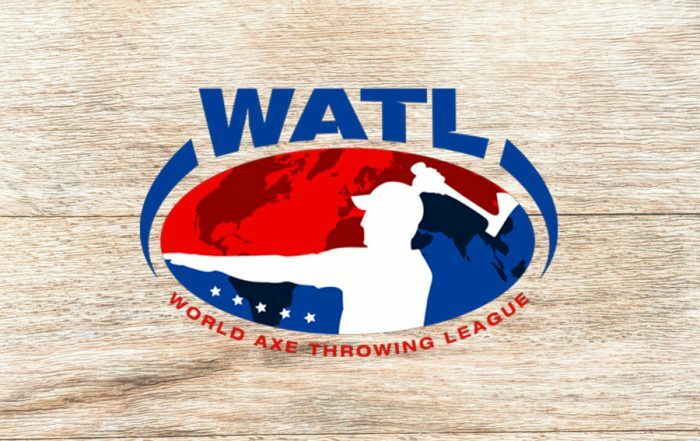 Axe throwing is carried out under specific and precisely determined rules by WATL. Entrance to the fenced range is only allowed under the supervision of the instructor. The instructor informs the participants about the rules and instructions for safe play and leads the participants through the program of various games and explains the rules of scoring before each game. Safety first. Always follow the instructions of the instructor (the instructor is always right). 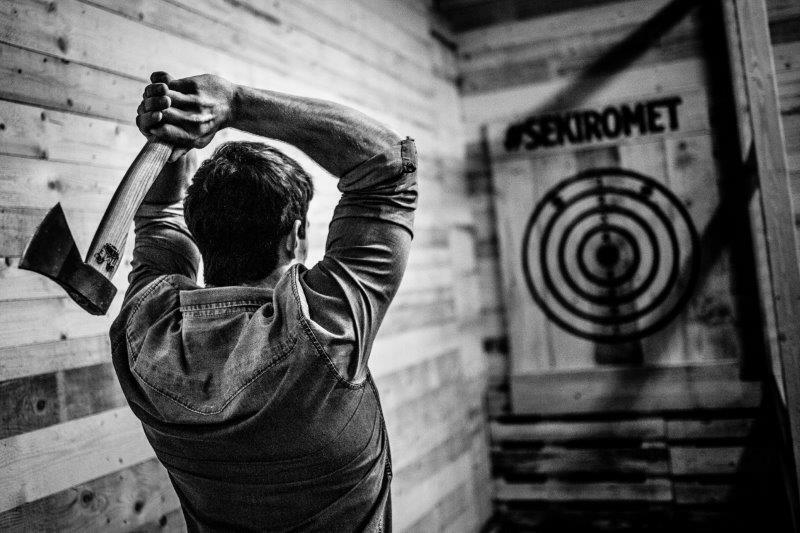 You must be 18 years old or older to take part in axe throwing. The younger ones must be accompanied by parents or legal guardians. Each player is obliged to sign a statement of consent to the approach of the game before the start, agreeing to the general conditions and processing of personal data, giving the understanding of his rights according to GDPR. A maximum of only two players and the instructor are allowed in the fenced range area at a time. 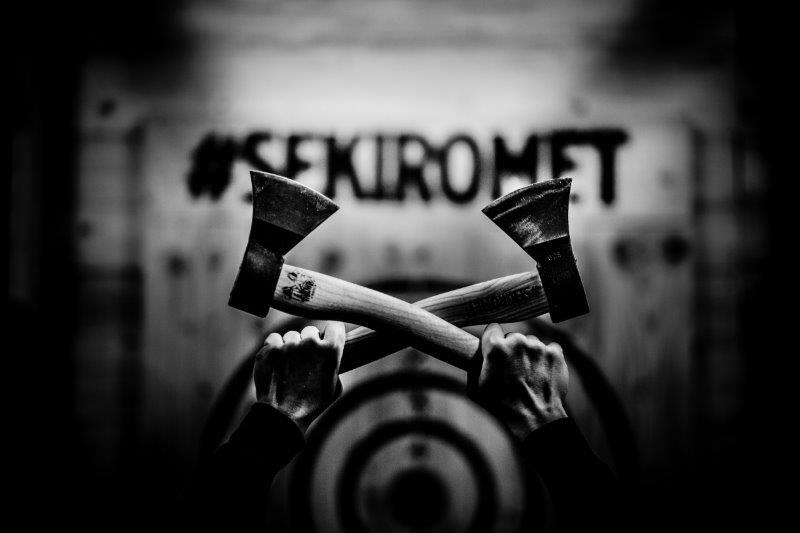 Each player throws an axe at the target according to the instructions. If a player deliberately throws the axe into the side wall, the floor or ceiling, he/she may disqualified by the instructor. The players must throw and pick up the axe at the same time. Never pick up the other player’s axe, only pick up your own and only when both players on the parallel tracks have already thrown their axes. 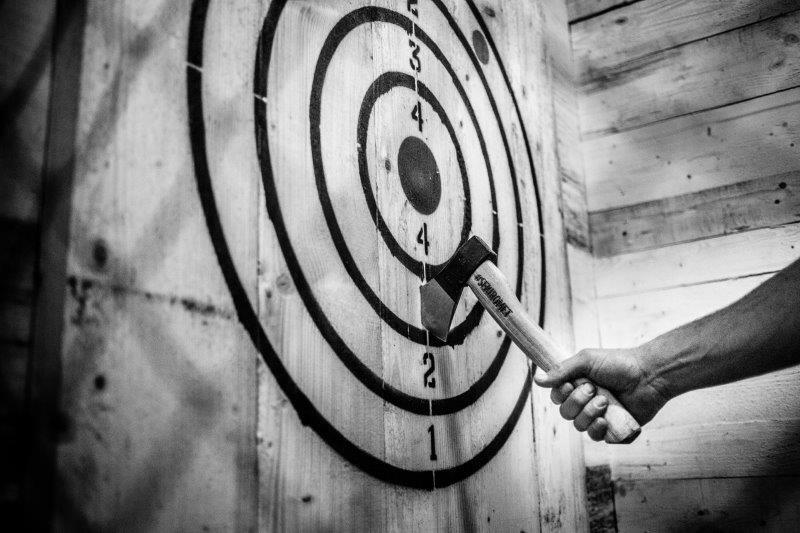 If the axe does not stick into the target, never try to catch it. 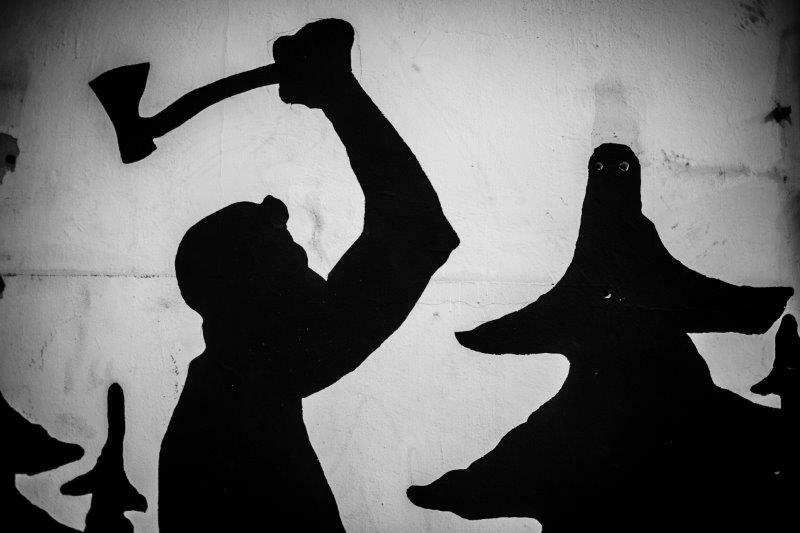 Stand back and wait for the axe to finish its way. When the axe has stuck into the target, remove it only by grasping it by the handle and scrolling it up and down. Never touch the axe blade, hold it always by the handle. 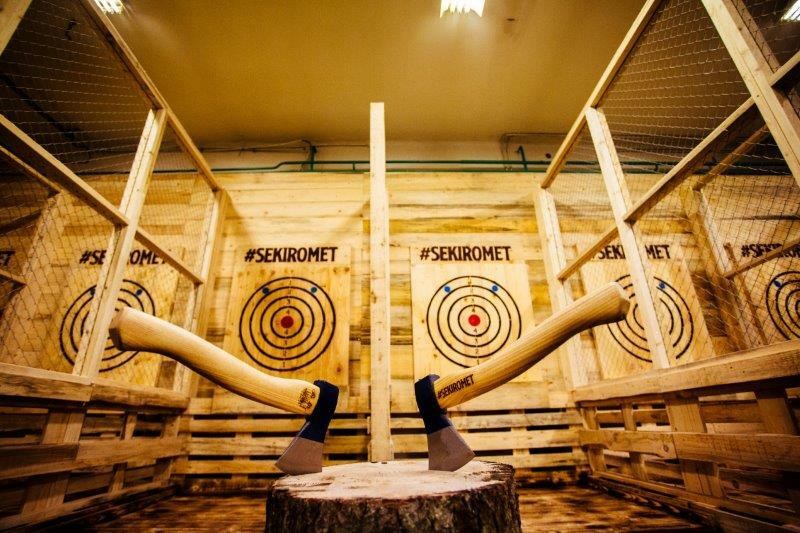 The game must only be played with Axe Throwing Europe Center’s axes. You are not allowed to take axes out of the playing area. Players must wear closed-toe shoes (open-toe shoes and sandals are not allowed). A player who is under the influence of alcohol, drugs and any other substances or medicines which may impair his psycho-physical ability is not allowed to participate in the game. Or, if his psycho-physical state changes, he must immediately stop the game. 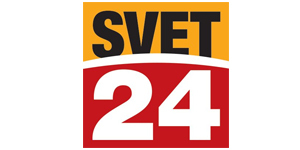 The instructor may prohibit further play if he doubts the mental and physical ability of the player. The player is obliged to follow the instructions provided by the instructor before, during and after the game. If during the game a third party or force majeure prevents the continuation of the game, the clock stops. 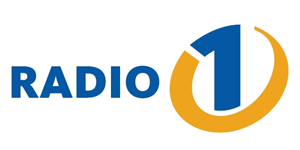 The game may proceed at the player’s request as soon as the reason for the interruption passes. Otherwise, the value of the ticket will be proportionally refunded to the buyer. 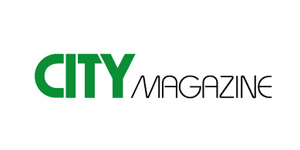 The player plays at his/her own risk and responsibility and is obliged to consistently protect his/her property and health, and to avoid sources of threat or abstain from practices that may endanger his/her safety, health and property as well as that of the provider or other players. 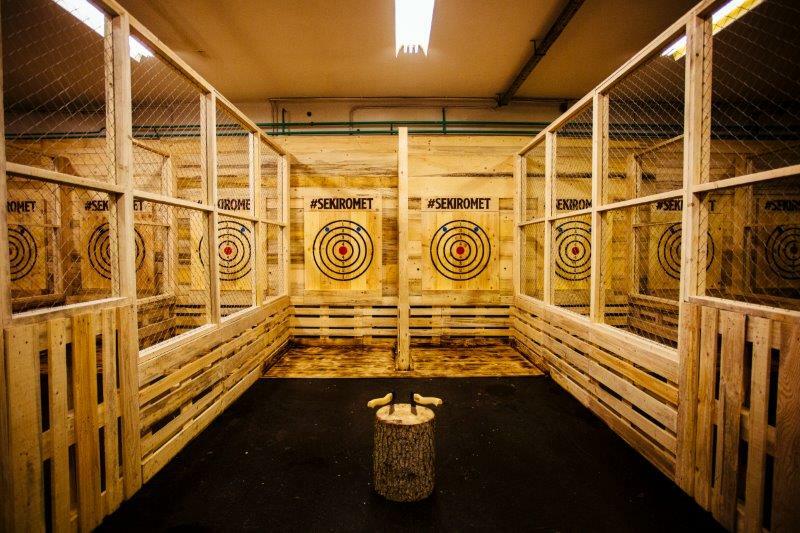 Axe Throwing Europe Center™® can be found at Kajuhova 35 (intersection of Cilenškova ulica and Kajuhova ulica) on the outskirts of Ljubljana’s BTC, next to Bauhaus. There are signs leading to the entrance as well as enough parking spaces in front of the facility. From the city center, you can also come by LPP bus No. 2, 7, 25 or 27, or, of course, on foot or by bike. The game is not about strength, the most important thing here is the technique. That’s why everyone can have fun, regardless of strength or gender. It’s important that before the game each player signs a statement saying that he/she understands the rules and will respect them. Youth under 18 years old (we recommend that children are older than 8 years) can play only in the presence of a parent or legal guardian who signs the statement for them. The center at the Kajuhova 35 is also accessible by wheelchair. Pregnant women and people with health problems are advised to consult a doctor before the game. 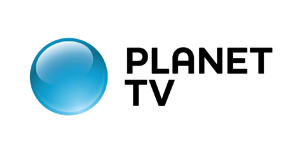 How does the program run and for how long? 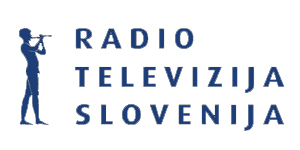 The program, which we call a “show” takes 90 minutes. 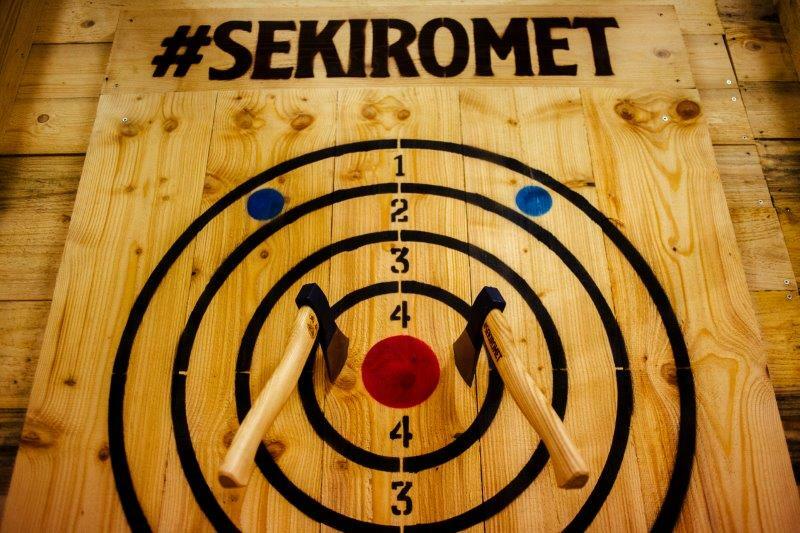 Up to six players can play on each target. 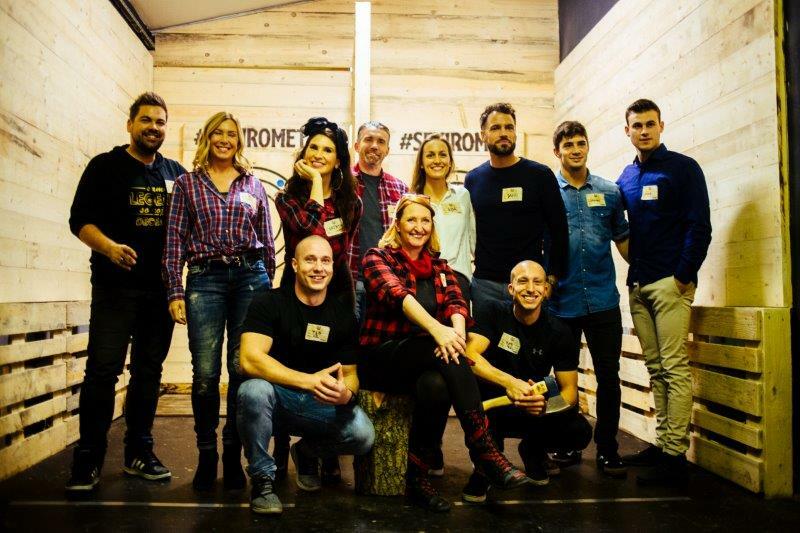 If you come in alone or in two, prepare to meet new people – we combine teams so that we can provide a comprehensive program and the full experience of axe throwing. The program is conducted under the guidance of experienced instructors: from presentation, rules and security procedures, demonstration of the right throwing, through fun competitions in various games and a final tournament who will determine the winner. Later, you can celebrate the results in the social area. At the center, we have 6 ranges with 12 targets. The optimal number of players is from 4 to 5, the maximum number is 6. This means that from 60 up to 72 people can throw axes at the same time. 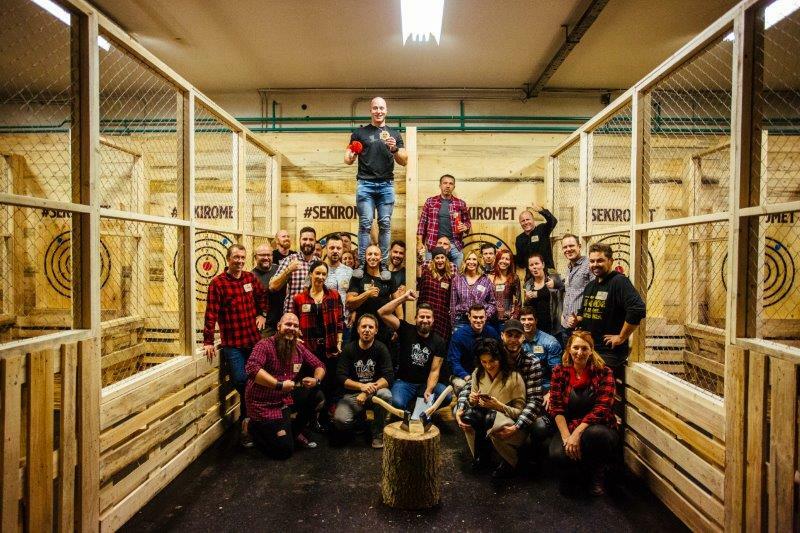 If your group is bigger and you buy all the space, we will adjust the program so that everyone can enjoy throwing axes. Even if you come alone, you will have fun as we combine players and make sure they can play in team games. 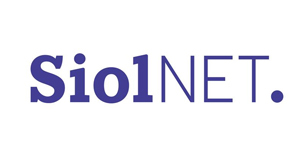 This also gives you opportunity to meet new people and have fun. Experienced players who will want to visit us more often and train for the championships will also have opportunity for individual training at club prices. No worries! Part of the center is also intended for gathering and a catering offer of food truck, there are also selected drinks and snacks. When booking for larger groups, request an offer for food and drinks in advance. 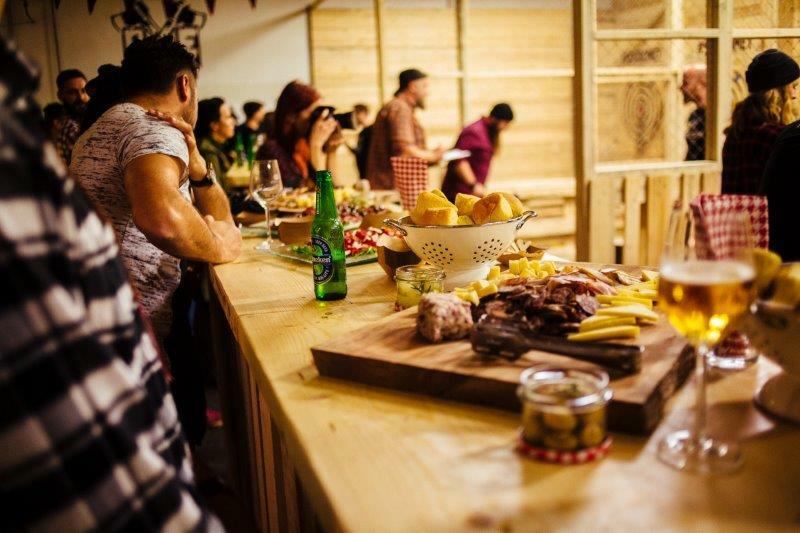 We recommend that you play the games first, and after you’re done with throwing axes you can enjoy food and drinks. 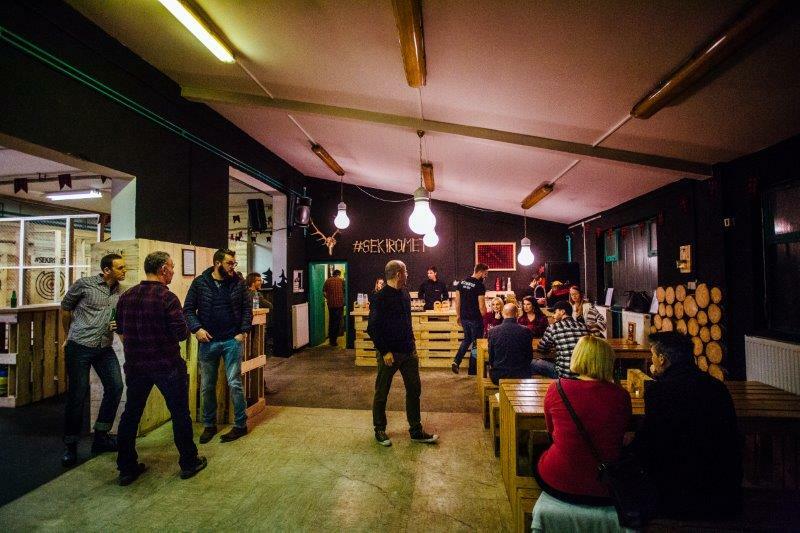 Bringing your own food and drinks as well as bringing them into the fenced range for throwing axes is not allowed (you are also not allowed to take axes out of the playing range). I like it? Where can I buy a gift certificate? 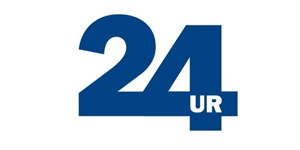 Reserve date and hour through our online reservation system above – simply select date, hour and number of people. 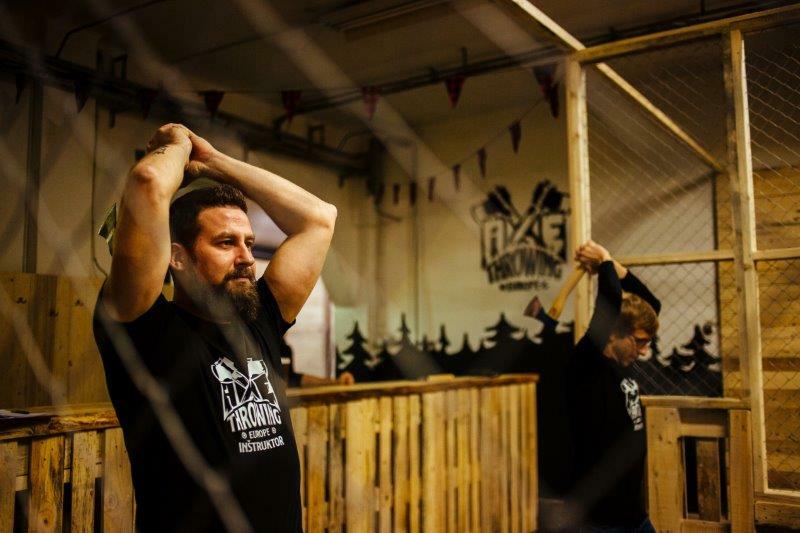 You can pay via PayPal (which allows secure payment with the card), via pro forma invoice – write to info@axe-throwing.si. 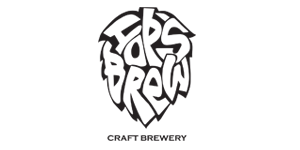 Or you can also pay with cash on arrival. 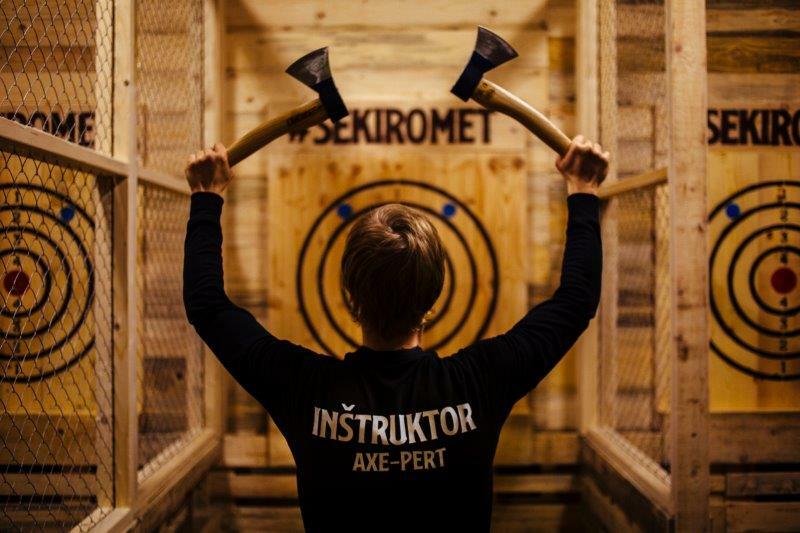 Throwing axes under the guidance of the instructor is more fun when players are arranged in groups – the minimum number of players is 4, the optimum 10 and the maximum 12 players per fenced range with two targets. 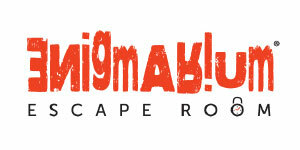 Expect pleasant socializing, competitive atmosphere and new friendships! 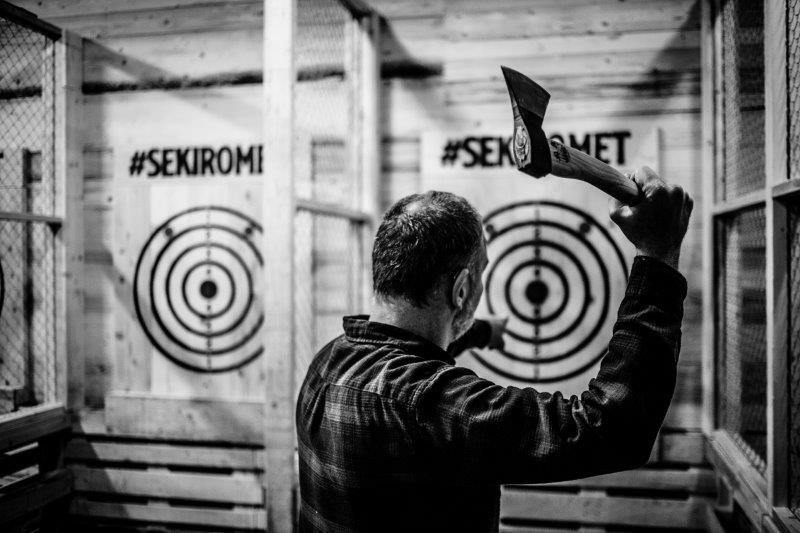 Please come on time or at least 10 minutes before the start of your term at Axe Throwing Europe™ Center at Kajuhova 35. If you arrive by car, park at marked parking spaces in front of the center and follow the signs to the main entrance. 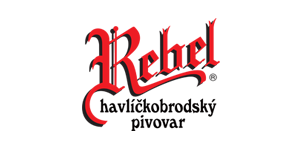 Wear closed shoes (sandals are not allowed), red-black-colored shirts (and beards) are desirable, but not mandatory – you receive everything else with us. Since axes and alcohol do not belong together, come sober. 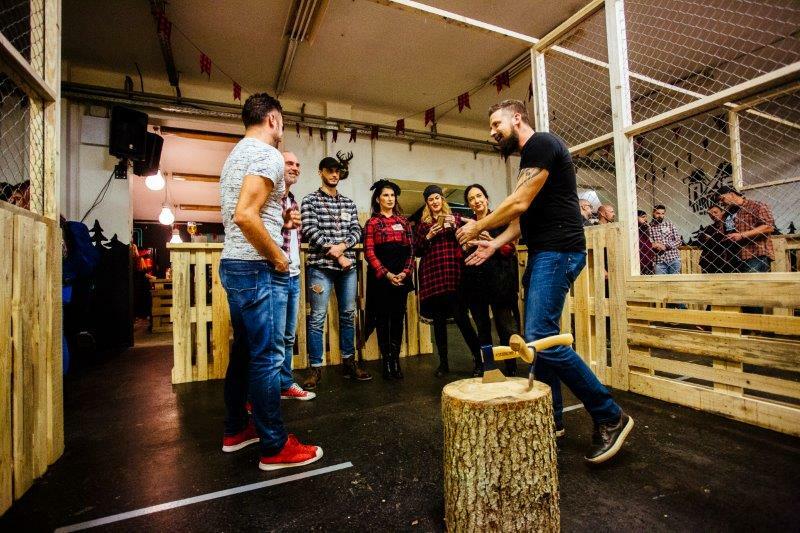 Wait at the reception for instructor – he will come to you and take you to the fence, explain the instructions and ask you to sign a mandatory statement about respecting the rules and playing at your own risk… then “show with axes” can start! 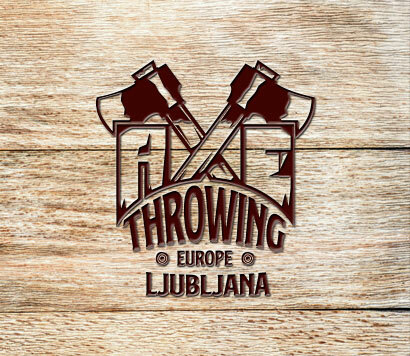 AXE THROWING EUROPE™ – LJUBLJANA, KAJUHOVA 35. 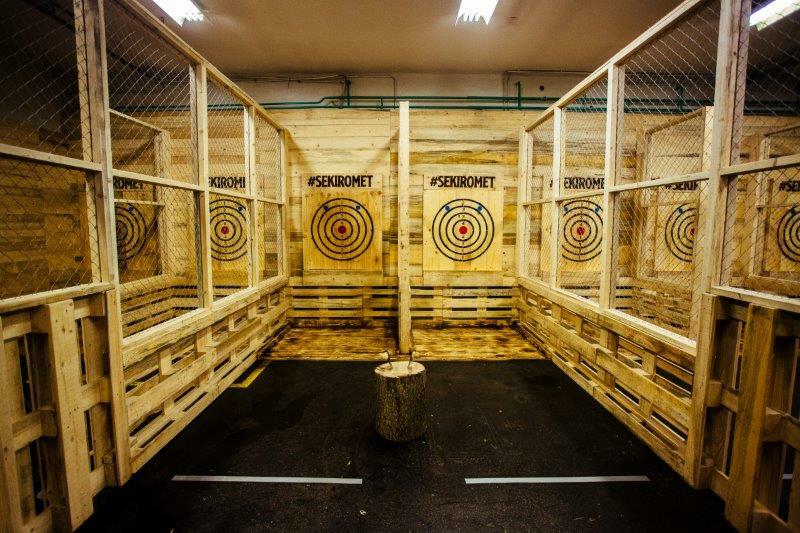 Up to 100 people can compete at throwing axes at the same time on 12 targets and in more than 300 m2. 90 minutes of fun awaits you ! 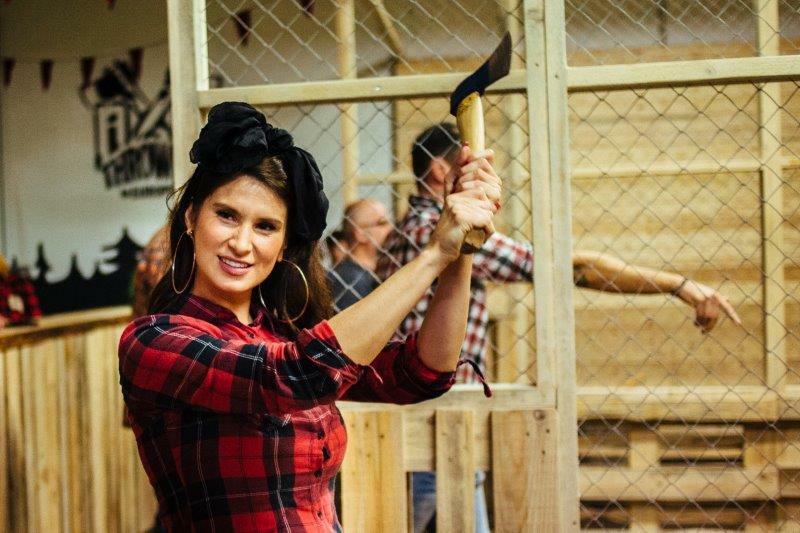 Here you will have an hour and a half of crazy fun – axe throwing! AXE THROWING EUROPE™ soon in your city? 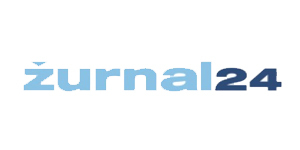 We invite you to participate! 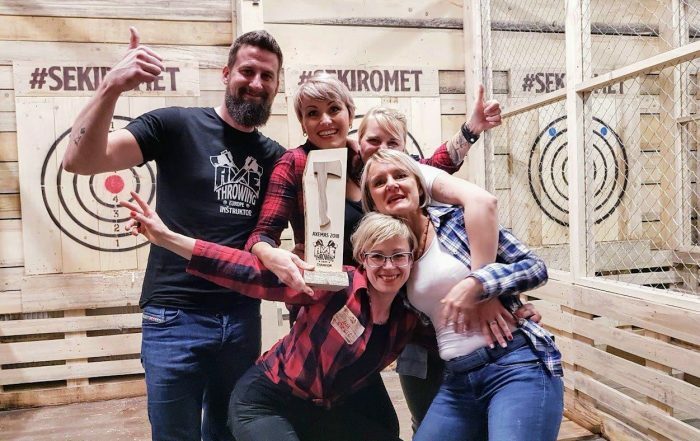 If you like axe throwing and you believe that it would spice up the touristic and sports offer of your city, just let us know – together we’ll be even better!